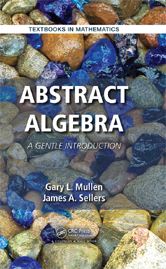 Editor/Author Mullen, Gary L. and Sellers, James A.
Abstract Algebra: A Gentle Introduction advantages a trend in mathematics textbook publishing towards smaller, less expensive and brief introductions to primary courses. The authors move away from the 'everything for everyone' approach so common in textbooks. Instead, they provide the reader with coverage of numerous algebraic topics to cover the most important areas of abstract algebra.